Kentucky Secretary of State Alison Lundergran Grimes is seeking to do more than become the first female United States Senator from Kentucky. Her agenda is much bigger: To break the decades-long tyranny of anti-labor, anti-worker Senator Mitch McConnell. She has been ridiculed by opponents as an “empty dress,” but in a state that is traditionally dominated by Republicans, her maligners are finding out—and fast—that she is no empty dress. She is a force to be reckoned with. Perhaps that fearless spirit — along with her pro-union, pro-middle-class ideals — is why the Democrat is currently ahead, although slightly, in polls compared to McConnell. 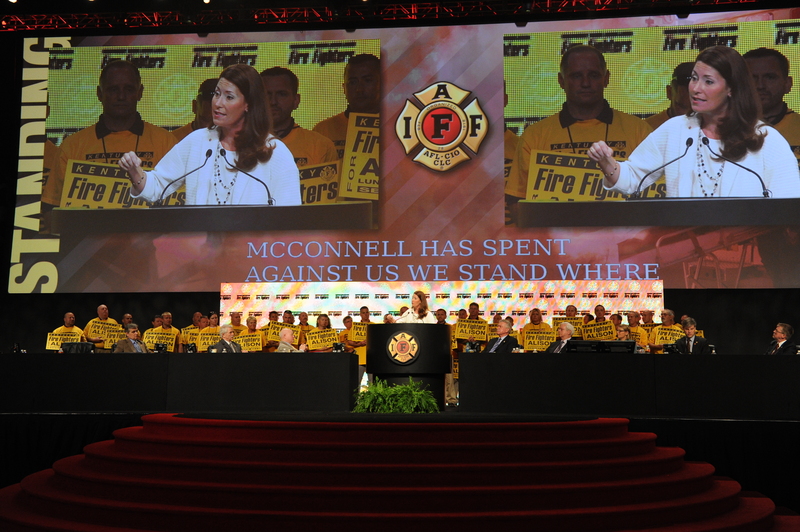 And it certainly is part of why she has the support of Kentucky’s fire fighters, who stood behind her as she spoke on the dais donned in gold and black shirts and proudly held “Fire Fighters For Alison” signs. Said Grimes, “I stand here today as Kentucky Secretary of State because fire fighters stood with me every day in 2011.” Grimes was elected as Kentucky’s Secretary of State in 2012. She has an excellent chance of defeating McConnell. She has set a fundraising record in Kentucky of $4 million from April through June, with donations coming from every county in the state. In total, she has raised more than $11 million. “Kentuckians are ready for a senator of today, not the senior senator of yesterday,” Grimes said of Mitch McConnell. She blasted McConnell’s abysmal record on labor, wages and equality, noting that he and politicians like him are destroying the middle class and the working class. She went on to list many additional bad ideas and actions of McConnell, including his role in the 16-day government shutdown in 2013, his support of right-to-work laws (which she said was just a cloaked way to say “union busting”) and perhaps the most absurd thing that’s come out of McConnell’s mouth. With great conviction, she said, “I stand here today because of two amazing grandmothers who taught me that I can do anything I set my mind to.” At 35, Grimes is an accomplished attorney, the Kentucky Secretary of State and, the way things are looking, perhaps the first female U.S. senator from Kentucky — and the “empty dress” that will unseat a radical, mean-spirited tyrant whose three decades of anti-worker legislating will be over. View here entire address here.